In my mid-twenties I was a folksinger/musician/guitarist in Alaska when I was diagnosed with a progressive congenital hearing loss. I turned to painting as a way to make music visually in case I lost all my hearing. I chose watercolor painting because it felt more like acoustic finger style guitar to me. My painting is inspired by the natural environment around me. When I started painting I lived in Anchorage, Alaska, which lies at the foot of the Chugach Mountains adjacent to Historic Cook Inlet. 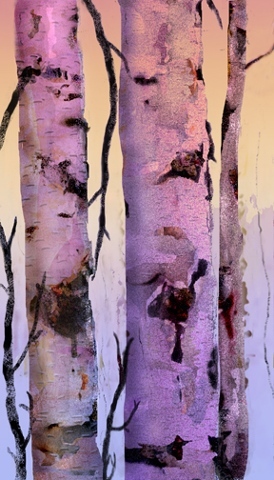 The city is surrounded by magnificent birch forest which inspired many of my early paintings. My more recent drawings and paintings are visual memories of thousands of walks I took through those boreal woods.